Constitutional Carry Hearing THIS MORNING – CALL NOW! Politics runs on momentum, and right now that momentum is red hot for the Constitutional Carry hearing happening this morning! That’s why I’m asking you to read this short email in its entirety and call the members of the Public Safety Committee right away. You see, anti-gunners are trying hard to KILL our momentum and destroy Constitutional Carry. In fact, their radical militants are working overtime to create the momentum needed to pass their gun-control agenda! 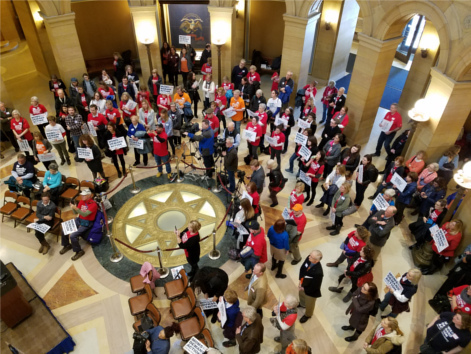 We saw it first-hand yesterday as Bloomberg’s hordes of “activists” crawled through the halls of the legislature demanding legislators to pass “Statewide Gun Registration” and other gun-control measures. 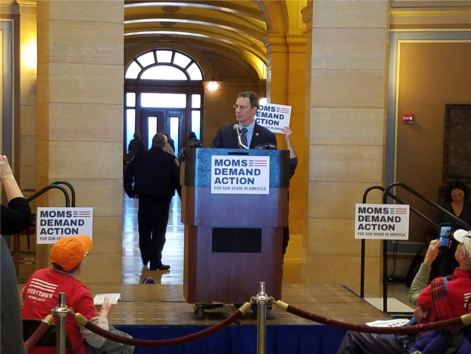 Then notorious anti-gun Senator Ron Latz assumed the podium for their anti-gun rally, feverishly working the crowd of “moms” into a frenzy, promising to faithfully work at passing Bloomberg’s gun-control. But gun owners just won’t stand for it. That’s why we were there, too, meeting with legislators and dropping off petitions from over 20,000 gun owners across the state in SUPPORT for Constitutional Carry! I don’t know about you, but it gets old when gun-control organizations come back, year after year, to kick in the teeth of gun owners. And that’s why I need you to contact the members of the House Public Safety Committee THIS MORNING and tell them to vote Constitutional Carry OUT of committee! I can’t think of a better way to swing back at the gun-control advocates who have been attacking our gun-rights for years than cramming Constitutional Carry into law! But it isn’t going to happen without your help. That’s why I’m asking you right now, this very minute, to contact the members of the Public Safety Committee and demand that they pass Constitutional Carry out of committee with NO weakening amendments! At the moment, momentum is on OUR side. Constitutional Carry is on the move across the country. South Dakota, North Dakota, Wisconsin and Iowa are ALL considering Constitutional Carry in their legislatures this year! And after New Hampshire became the 12th state to enact Constitutional Carry law just two weeks ago, there isn’t a better time to pass this than now. But what if Governor Dayton vetoes? It’ll EXPLODE gun rights into one of the biggest issues in the coming gubernatorial election, setting gun owners up for the biggest pro-gun victory in years! That’s why this morning’s hearing on Constitutional Carry is so important. Please make the calls – and when you’re done please forward this email to your friends and ask them to do the same. P.S. Capitol insiders are telling us that anti-gunners are working desperately to kill off this bill this morning in the committee. So please go to the list above and contact the entire Public Safety Committee and give them one simple message: vote Constitutional Carry OUT of committee, with no weakening amendments! Anti-gun Real ID bill DEFEATED in MN Senate!